Today we're going to pair accessories with varsity tees. It's football season and you may not have a team or a clue as to why they're throwing yellow flags, you can participate. You totally can. Bring the queso and try these sporty yet chic options. I love this combination because it's simple. This necklace is longer so you can layer it or leave as is. I also like the slub green tee. I love this look. The 3/4 length sleeve is perfect with a denim jacket and this necklace. Well, do I even need to say anything? Pink, white, and black. Simple, crisp, and easy for any fall day. I like the neutral style and the combination of the textural necklace with a soft cotton tee. Dress up this weekend and turn some heads while looking the part! 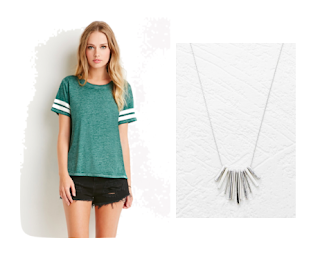 Pair a statement necklace with a simple and casual tee.